I remember the days when I was content with ten eBay listings monthly. Twenty had me feeling overwhelmed. Right now I'm juggling over 150! I think I can stay on top of it if I only thrift once a week and dedicate time to photographing and researching whether or not I have listings available. Turns out this Salvation Army does half priced tickets on certain days and this was the first time I bought something with a correspondingly colored sticker. What are the odds? While this cup's color drew my attention I mostly bought it because it was next to more of its kind. The other, identical cups were packaged together in sets of four for $9.99. There were matching and equally as expensive small plates and tea accouterments too. This one was on its own for the typical mug price of .29. The internet says they are nothing special so I don't know what happened to the pricing. 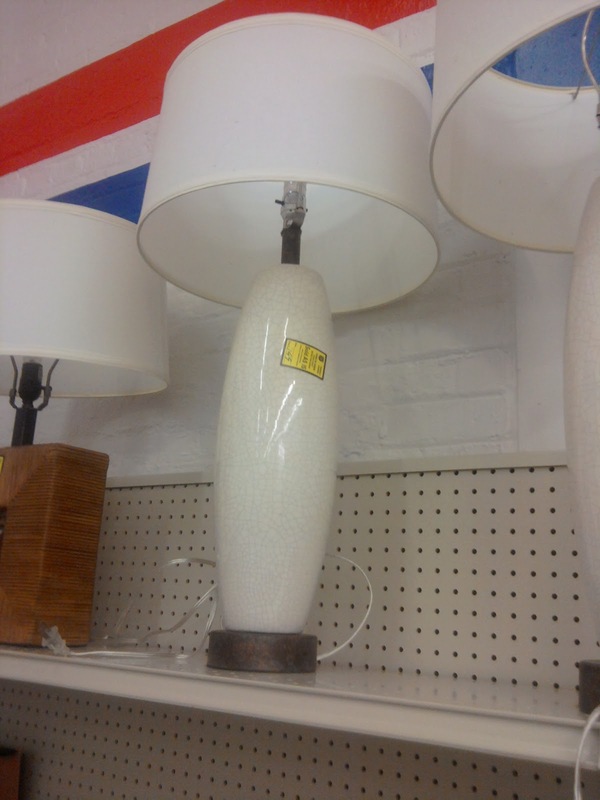 They had about 7 of these TALL lamps for $7.99 each. The brass has seen better days but I loved them. Then I left the store wondering if I liked them or the midcentury brainwash is working. Unsurprisingly I have a crapton of Christmas decorations already but I've been spending a lot of time with a five year old and her tastes must be rubbing off. How else would you explain those shiny pink baubles? Isn't this ornament peculiar? They had at least fifty of these with different things inside. Some where nature, others were sports and pastimes. This was the only religious one. I can't tell if they were someone's hobby or mass produced. I bought 4 water glasses for $1 and really want to keep them for my imaginary parties where we laugh and clink glasses. In reality they won't fit in the cupboard. So I count nine new auctions to set up. That's do-able. I really wonder who Office Depot's buyer is and how I can take over their job. Cause most of the stuff they buy is clearanced out in order to display equally out of place items. Did you see the desktop water fountains yet?